Look – I promise* that this is the last time I'll talk about the Apple Watch in this column. To most of you it's either a shiny piece of frippery or something you've had your eye on but don't know how to admit you want to buy - not a genuine running purchase. But the fact is I've not seen this much hoo-ha over a wearable device for running for, well, actually ever. 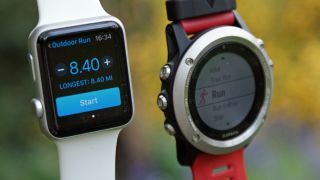 Most couch-dwellers don't know the first thing about a Garmin or Polar, but they've heard of the Apple Watch and most seem to be aware that it's apparently able to help people get running. So while I was writing the main Apple Watch review I was out pounding the streets, seeing if Apple's new wrist-beast could actually impress enough to warrant becoming my main exercise tracker – especially as it does so much stuff outside of the sweat-inducing arena. In case you're desperate to get to the bit about me nearly drowning again, I'll make this quick for you: the Apple Watch isn't great for running. While there's a tonne that's wrong with it right now that prevents me from recommending it become your jogging buddy, there's enough potential there to not label it a complete fitness fan failure. (I'm not going to debate whether this Watch is better than the Android Wear brigade, because it's pointless. You'll either have an iPhone or Google-powered phone, and you're not going to buy your next smartphone based on which smartwatch is better). Let's start with the juicy bit: what the Apple Watch fails on for runners. The first one is obvious, and well documented. It doesn't have GPS and therefore is nearly useless as a running watch. It can work autonomously, but only with Apple's own Workout app. All the other third party apps need the phone to function. Perhaps you don't mind that – maybe you always run with a phone, and therefore can take advantage of the wealth of third party apps out there. However, start running and every time you raise the Watch to see how you're doing it'll default back to showing the time and you'll have to tap around a bit to see your stats (unless you're using Apple's Workout app). You can fix this – in the main Watch app you can alter it so the last used app, not the time, displays – but this means in day to day use the Watch won't show the time when you want it to. And it kind of needs to do that. It wasn't long before I started to long for the Garmin Fenix 3 again, as it has so many more advantages for the regular runner. Firstly, it can go 5-7 days between charges, even with regular use, where Apple merely makes it to each night before needing a charge. The Fenix can show smart notifications when someone has texted you, what the football scores are and whether you need to take an incoming call – and that's all I really used the Apple Watch for. I really wanted the Apple Watch to be waterproof, or let me customise the display to show the info I needed when running. I wanted it to let me race my previous activities or even delve into the data to analyse what I've done – which you can do, but need a third party app. But it didn't. In short, the Apple Watch is more about design and potential for future apps to come than about being a viable choice for the regular runner. The screen is too small to swipe across when running hard, and not being able to show loads of info is a real inconvenience as such. The Apple Watch does have some interesting elements to play with – the first being that it supports external heart rate monitors. This is brilliant news as the one on board is really quite useless when running, often telling me heart rate was rocketing when the chest strap told me I was fine. You can connect up Bluetooth headphones directly to Watch and listen to music stored on it (although there's a 2GB limit) without the phone around. It also lets you pay for stuff on the go, which would have been a lifesaver for me on occasion when I've been out without a wallet and needed a drink. That said, Apple Pay still isn't in the UK and I've not been able to test it yet – given we don't have a time frame for this I'm starting to wonder if Apple will have launched a new version of the Watch by the time it gets here. The Apple Watch is good for running if you're willing to accept some workarounds. That's not enough for me, and for any fitness lovers thinking of shelling out the large sums needed to buy it, I'd say it's best to go for a dedicated running watch – as long as you can deal with the larger size on the wrist. This is Apple's effort, and it's definitely basic. I like the fact that there are loads of options on there, from running to cycling to elliptical machine tracking, but the main running option is just a bit bland. The Watch is accurate enough without the phone to measure your distance (I like that it learns your stride pattern over time) but the info shown is just simple: time, calories burned, distance and heart rate (that latter being woefully inaccurate). There's no way to analyse the data post run and the only goals on offer are beating your previous longest / hardest / furthest – beginners need more than that, and it feels like this is the market Apple's created the Watch for. My current go-to app is really basic on the Watch – and a little irritating. You only get info on time, distance and pace (and the latter is actually average pace, which I didn't realise until well into a cycle and I'd decided the app just didn't work). You can choose between running and cycling, but the 'hard press' to change sports is erratic – I false started so many runs by accidentally trying to change this, and you annoyingly have to head into the app on the phone to delete unwanted workouts. This was by far the most impressive app on the Apple Watch. While you have to choose the sport from the phone app, while there you can customise your Watch experience, letting you choose all manner of elements to track - with multiple on the page at once. A close second for best app, and only such because you couldn't customise the interface as easily. However you'll get detailed breakdowns of your km pace as you run, can control the music from within the app and can delve into the history from the Watch itself. Very basic: this app feels like a brand just trying to get something out for the launch of the new Watch. Like Strava the only info is for time, distance and pace, with the main app needed to switch between cycling and running. Some bugs also remain (such as being told you can strength train on the Watch, but can't start the program). Another basic app, plus you have to swipe across the screens to see info on how far you've gone, how long for and at what pace. Probably the hardest to flick through while running, alongside the main Apple Workout app – but the latter at least has a better interface. A shout out for this app, which uses an external heart rate monitor (the Tickr X) to track you doing a quick high intensity burst of exercise. The Watch will show you how many reps or how long you've got left of each drill, and which one you're supposed to be doing. However, since this is all being shouted out through the speaker on your phone, which has to be nearby, it seems a bit redundant. It needs to offer Watch videos to show you how to do the exercises, not just mirror what a shouty man is saying. The above statement typifies exactly how I feel right now about the whole triathlon thing. The 14 June date for the race is looming and I'm worried I'm going to line up with all the best tech and then fail miserably to finish. That worry was heightened when I visited GlaxoSmithKline's Human Performance Labs this week to see what tests I'll be doing, finding out precisely how un-ready I am for this challenge. I won't lie though: I'm really excited about this. Even if I perform terribly in testing, five weeks later I'll get to find out if all the tech I've been testing has helped me at all, and I'll learn the weaknesses in my ability I can start to fix. And, get this: I'm slightly less terrible at swimming. I'm still really rubbish, but I managed to swim 1KM in the pool for the first time… well, ever. Actually, swimming is probably an optimistic description, as in an effort to keep breathing I was mostly flopping about like a goldfish when it starts floating weirdly and your Dad promises 'Yes, it will get better,' then says 'No, they change colour every three years'. And my weekly swimming lesson at the YMCA was another trip into sadness and despair. I had to keep being told to sit out drills to recover, and practicing treading water was awful: I did all the flappy hand movements like he said, but I kept sinking. At one point I went under for the fifth time, felt completely down and out with the blues, and wondered if I should get one of those 'drown monitors' – after all, tech is supposed to be helping me here. Then I decided if I did get in trouble in a swimming pool, the last thing I wanted was a siren highlighting the fact to everyone. I've at least sorted one part of the triathlon training kit: I'm going to be using these Adidas Ultra Boost trainers. The primary reason is that since I picked them up over a month ago, I've only had to undo the laces once: the tongueless construction makes them feel more like slippers, and they come on and off with ease (good for the bit where I go from cycling to running, I'm told). Trainers are different for everyone, and you should always get your feet analysed professionally if you can, but for me the heel is a lot more forgiving on these trainers, without making the sole too thin. I'm a midfoot striker, but recent pairs have forced me to thud down on the heel, which hurt my knees. A lot. These trainers have a much slimmer heel and it's helped massively. Add into that there's 20% more Boost foam (which uses polystyrene-like beads to bounce the energy back as you crush your body into the pavement) and an elastic mesh over the top that's airy and really stretchy to help with foot expansion, and I'm glad I've got one bit of the test ticked off. *I will utterly break this promise.